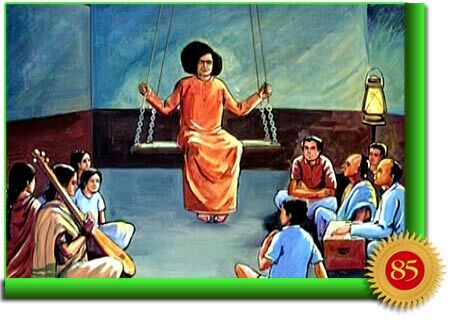 In the previous article we read how Baba had strikingly announced His Avatarhood by throwing down His school books, as if discarding off the chains that had kept Him from His mission. 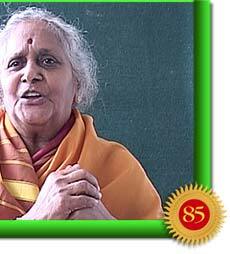 He had, however, consented to move back to Puttaparthi to the house of His longtime devotee, Subbamma. As a youngster, Sathya had craved the vegetarian food of her household. With Baba taking up residence in her garden, she started cooking for large groups of people who would throng there seeking darshan or to just remain in His presence. What began as a Thursday worship soon turned into a daily occurrence for the benefit of new arrivals. The bhajans were at first sung in an eight by eight ft. room, making it necessary for many to perch outside. Leelas or Divine Play was an everyday phenomena. Once, a few pilgrims arrived from Kamalapur. Baba asked if they would like to listen to Krishna’s flute. He bid them lay their heads on His chest and then what they heard was absolutely ethereal! The sweet strains of the lovely flute of the Krishna Avatar filled their beings; they just forgot themselves. 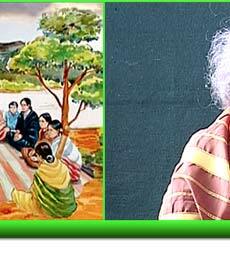 Mother Easwaramma herself has shared a thrilling experience. 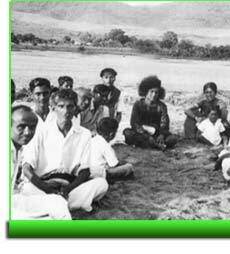 During those days, the high point of daily activity was walking to the banks of River Chitravathi, where bhajans were sung. As the Sun would go down in the western sky, the group of 30 or so in number would set forth. They would carry various musical instruments needed for accompaniment during singing, a big carpet to spread on the sand, odd vessels, and a few lanterns. 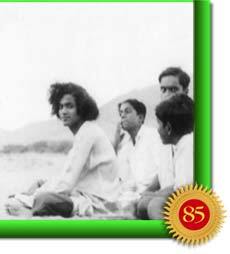 As the group made its way, there would be an air of tremendous excitement and anticipation as any moment Young Sai would start His play. Each day was different, and there were infinite variations to the theme. 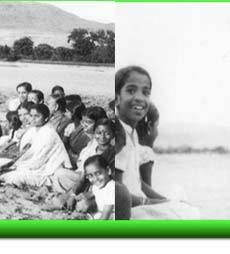 Mrs. Vijayakumari in her book, “Other Than You, Refuge There Is None or Anyata Sharanam Nasti”, has documented a few experiences. She explains that on a small hill adjoining the Chitravathi river, there was a tamarind tree. Decades ago, this tree, now known as the Kalpavriksha or “Wish Fulfilling Tree” was the scene of many a Leela. Thus Baba taught the impermanence of material things. But the tree was a great storehouse of nectarine presents too. “Coming down from this rock, we would assemble on the Chitravathi sands at a suitable spot selected by the devotees. After singing for some time and listening to Swami’s Discourse on the pranks of Krishna, we would exclaim that we were hungry and pester Him to give us something to eat. Even as He moved His hands on the heap of piled-up sand, we would be able to predict what He would be pulling out. We could recognise the smell of Mysore paak, an Indian delicacy. Gheewould drip from it and it would be hot. He would then place the pieces on a tray and serve us all with His own hands. How am I to describe that taste! 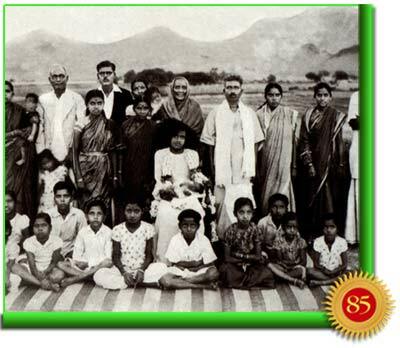 Mrs. Vijayakumari’s brother, Mr. V. R. Krishna Kumar, was also bidden by Baba to record his memories of those days. His book, “Divine Games of Bala Sai”, includes a curious incident wherein Bhagavan apparently vanquished a curse in an area considered haunted by the villagers. “One day Swami asked us to bring long ropes and made us tie them to a huge tree. 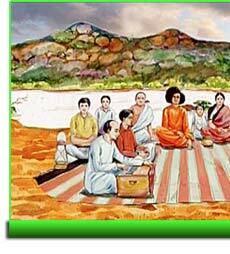 “When Swami started swinging with the help of people over there, He was not at all satisfied. Even if four or five well built people pushed Him with all their might, He was not pleased as the swing went up to a certain height only. 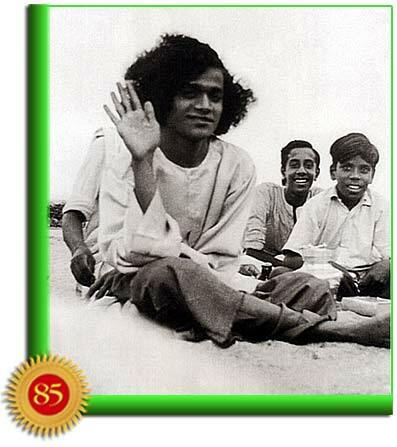 After sometime, Swami told everyone to stand aside, at a distance; He ridiculed that their combined strength was not of much use. And now all by His own effort, He started swinging continuously, and went increasingly higher. In a short time, He seemed to reach the sky! People around were totally confused; they went out of their senses. The swing that could not go above a certain point with all the combined efforts was suddenly flying like a rocket. All of us started shouting loudly, but how could our ‘Rocket Sai’ hear our calls? 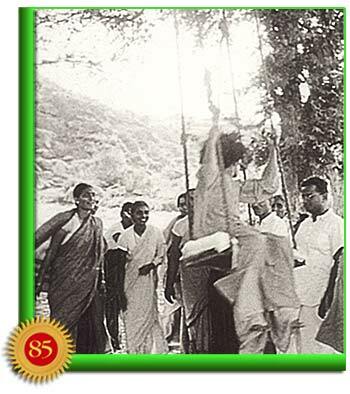 “As we watched, the big branch onto which we had tied the ropes started breaking, but Swami continued to swing. Mrs. Vijayakumari also recounts a terrifying moment. We then saw a huge snakecoming towards us. This was no ordinary reptile! It looked verily like Adi Sesha, the Divine Serpent on whom Lord Vishnu reclines. It was immense in size and we could not see its tail. As it came forward slithering and twisting sinuously as if dancing, it looked charming. Baba has granted visions of His own manifold forms to many. These boons make cherished memories. Father Pedda Venkappa Raju had his special moment too. An old friend, Mr. Krishnamachari, a lawyer, arrived from Penukonda. Visiting over coffee at Subbamma’s house, it soon emerged that this person in the legal trade was sceptical of all claims of Baba’s phenomena. He further charged Father Pedda Venkappa Raju with trying to cheat the innocent village folk with “tall stories”. The Father Raju was so upset that he went to Baba, who happened to be in the Raju household at the time, and challenged Him to convince the doubter of His Divinity, so the attacks would subside. 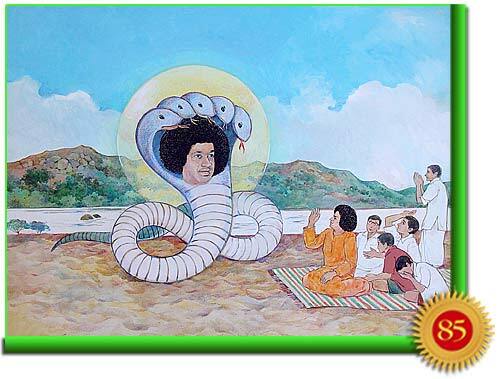 Sathya Sai asked Father to bring everyone with doubts directly to Him. So, the lawyer including many others went to Pedda Venkappa Raju’s house; Subbamma was there too. And now Sai Baba took each, one at a time, to an inner room, where they were treated to a vision of Sai Baba of Shirdi in deep contemplation, complete with flowers, smoke, incense, and an attendant in the corner repeating mantras. This inner enclosure appeared to be a vast open space, with known landmarks of the Shirdi avatar: the Anjaneya Temple, the famous Margosa Tree, and the entire Shirdi landscape spreading out for miles to the horizon in the distance. This was a pivotal moment, for even Father Pedda Venkappa Raju. He was a changed man. All doubts about his Son had vanished. The experience also convinced Subbamma that Shirdi Sai and Parthi Sai were one and the same. As for the lawyer, he apologized for his remarks and recognized Sai Baba as a “Divine Phenomenon”. As news spread, worshippers of Shirdi Baba came out of curiosity. Many persuaded Baba to move to their places and thus Baba went to Bangalore and visited houses that had contacts with places far afield. While in Bangalore, Baba materialised surgical instruments and performed an operation on an ulcer patient. The surgery provided complete relief, so the stream of pilgrims increased all the more. One such visitor was a poor old cobbler who happened to peek into a bungalow where he witnessed the beauty of Baba’s darshan and the effect it had on all. Baba rose and walked up to the man, taking his dried up garland before the shoe-maker offered it. Baba also enquired what the poor man wanted. “Please come to my house also and accept something,” the man said. Baba assured him that He would, and resumed His seat at the other end of the hall. He never got the chance to give Baba his address. How could He make His way through the slums to find it? Days passed, and the poor cobbler gave up any hope of his request coming true. Suddenly, one day, a car pulled up in front of his stall. Here was Baba, inviting the man to get into the car. The man was too confused to give directions to his hut, but Baba seemed to know. The family was graced with sweets and fruits materialised by Baba. Then He blessed the old man and partook of some plantains offered by the cobbler.